Welcome to Week #5 of the OCG 2018.10 format. 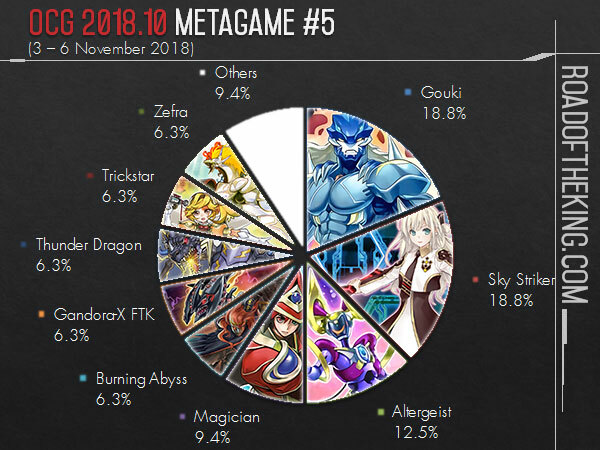 This report will cover 32 top-performing decks from 6 tournaments that were held in Japan during 3 – 6 November 2018. 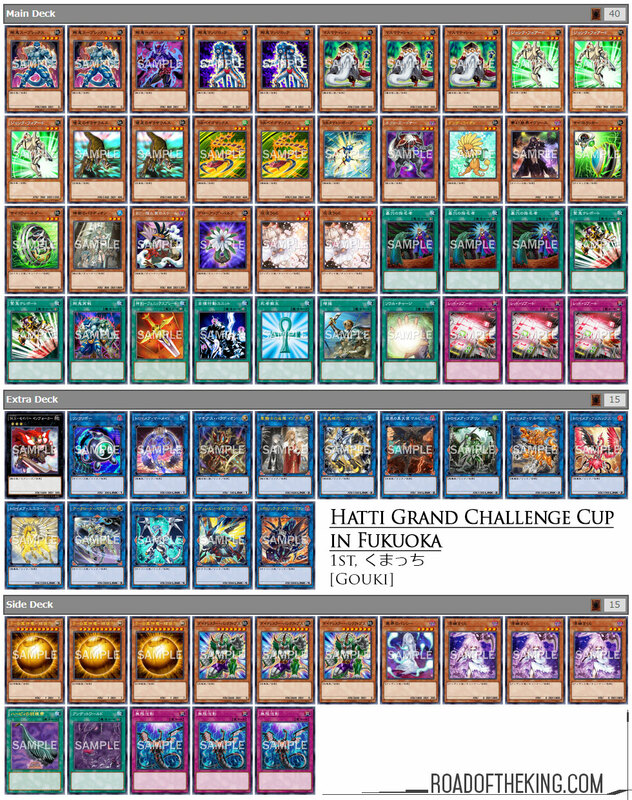 Kumatch (くまっち) went 9-1 (including 1 bye) and finished 1st in “Hatti Grand Challenge Cup in Fukuoka by HAKATA CUP” which had 84 participants. Running 1 Necroworld Banshee and 1 Zombie World in the Side Deck of Gouki is trending as a tech against the Gouki mirror match. While Zombie World is on the field, neither player can Tribute Summon monsters except Zombie monsters, and that would prevent the opponent from breaking your board with The Winged Dragon of Ra – Sphere Mode. Setting up Zombie World is easy as both Armageddon Knight and Mathematician are able to send Necroworld Banshee from the deck to the graveyard. Necroworld Banshee‘s graveyard effect would then activate Zombie World from the deck. Other than the Gouki mirror match, Zombie World is also useful against Thunder Dragon. 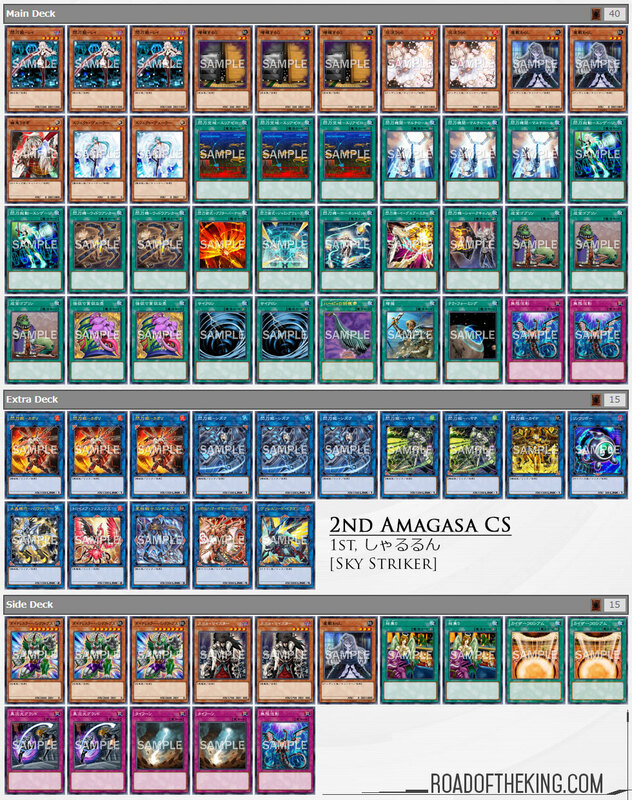 Sharurun (しゃるるん) went 8-0 and finished 1st in “2nd Amagasa CS” which had 39 participants. Kaiser Colosseum is seeing play in the Side Deck of Sky Striker against Gouki. As Sky Striker usually ends with only 1 Link Monster on the field, Kaiser Colosseum essentially limits the opponent to placing only 1 monster on the field. Gouki would be unable to perform any Link Summon when limited to only placing 1 monster on the field. 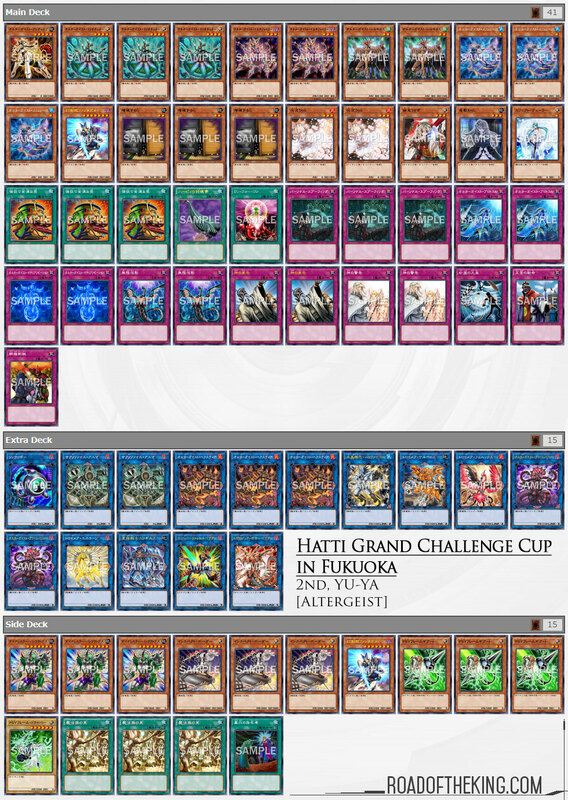 YU-YA went 9-1 (including 2 byes) and finished 2nd in “Hatti Grand Challenge Cup in Fukuoka by HAKATA CUP” which had 84 participants. Most Altergeist are now running the full 3 copies of Pot of Extravagance in the Main Deck. 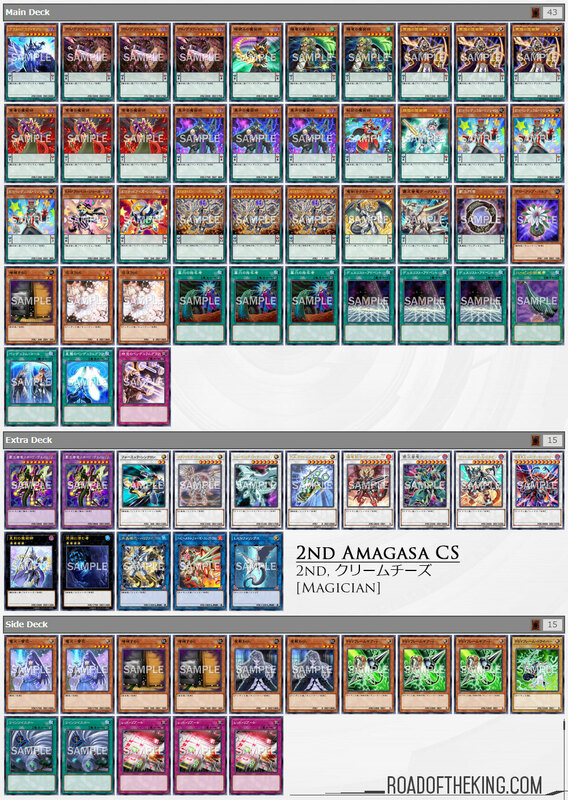 Cream Cheese (クリームチーズ) went 6-2 and finished 2nd in “2nd Amagasa CS” which had 39 participants. He had a spicy tech Hot Red Dragon Archfiend King Calamity in his Extra Deck. Open with any standard play to bring out Heavymetalfoes Electrumite, whose effect will get Astrograph Sorcerer and then Special Summon Astrograph Sorcerer with its own effect. Using Heavymetalfoes Electrumite + a Tuner Monster, Link Summon Crystron Needlefiber whose effect will Special Summon Glow-Up Bulb. Astrograph Sorcerer + Glow-Up Bulb will then be used to Synchro Summon Borreload Savage Dragon. Upon its Synchro Summon, Borreload Savage Dragon will equip Heavymetalfoes Electrumite to itself and gain 2 Borrel Counters. Glow-Up Bulb‘s effect is activated to revive itself before ending the turn. During the opponent’s Main Phase 1, after the opponent plays their first card or effect, you may choose to negate it with Borreload Savage Dragon, depending on how threatening it is. Then right after the resolution of that Chain, when the opponent passes priority back to you, you could then activate the effect of Crystron Needlefiber, banishing itself to Special Summon Shooting Riser Dragon from the Extra Deck. Upon its Synchro Summon, Shooting Riser Dragon will send any Level 4 monster from the deck to the graveyard, thus reducing its Level to 3. Again right after the resolution, when the opponent passes priority back to you, activate the Quick Effect of Shooting Riser Dragon to perform an Accel Synchro. Using Shooting Riser Dragon + Glow-Up Bulb + Borreload Savage Dragon, Synchro Summon Hot Red Dragon Archfiend King Calamity. When Hot Red Dragon Archfiend King Calamity is Synchro Summoned, its effect will prevent the opponent from activating any cards or effect for the rest of their turn. Against Gouki or Magician, this would effectively cause the opponent to end their turn without any play. On the next turn, simply Pendulum Summon from your hand and go for an One-Turn-Kill. While the opponent cannot activate any cards or effects after Hot Red Dragon Archfiend King Calamity is Synchro Summoned, they are still able to set cards and summon monsters. Hence this is not quite useful against Sky Striker or Altergeist. Sky Striker could just Normal Summon Sky Striker Ace – Raye and then during your turn, activate its effect to Special Summon Sky Striker Ace – Kaina to stall King Calamity. Altergeist could set a Trap, and then flip it during your turn to follow up with Altergeist Multifaker, whose effect would then Special Summon Altergeist Silquitous to bounce King Calamity. 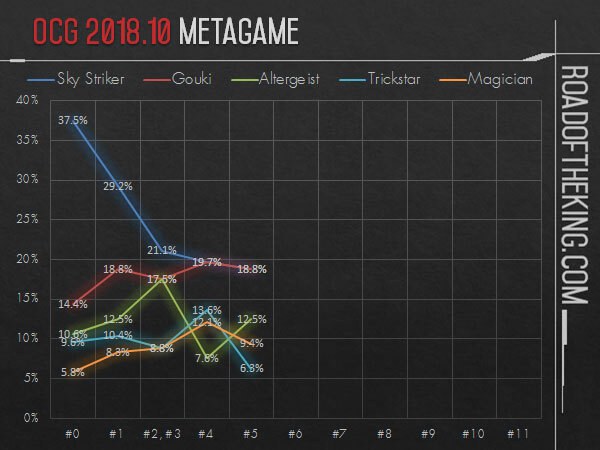 Gouki and Sky Striker remains as the top, with Altergeist and Magician following behind. The power level among the various decks are rather close and we are seeing a lot more players topping with unique decks in various tournaments. For this week we have a Madolche making Top 4 in “2nd Amagasa CS” and an Orcust making Top 8 in “Hatti Grand Challenge Cup in Fukuoka by HAKATA CUP”.